Posh star Marcus Maddison takes on the Plymouth defence. Photo: Joe Dent/theposh.com. 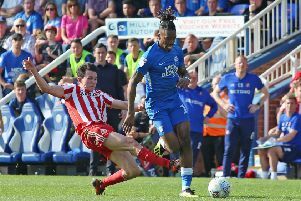 Peterborough United star Marcus Maddison has accused an opponent of spitting at him during today’s (August 5) 2-1 win over Plymouth at the ABAX Stadium. Maddison took to Twitter after the game to say: “For a fellow professional to spit on me while I’m down injured is a joke. Hope he is fined or banned. This ain’t League Two no more (sic). No Plymouth player was sanctioned by the officials for anything other than a foul on Maddison. Maddison appeared to upset Plymouth players when he stayed down claiming a foul after the visitors had broken away to score their goal.